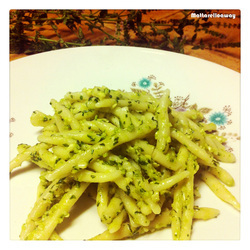 Questa ricetta che ho trovato all’interno del libro “ Le minestre della tradizione romagnola” mi sembra un’azzeccata rivisitazione del più famoso pesto alla genovese, con l’utilizzo di prodotti tipici della bassa Romagna. Perché non provarlo? Chop the herbs finely with a knife. Grate the parmesan cheese and chop the pine nuts. At this point put the herbs in a bowl and gradually add the parmesan cheese and pine nuts, tasting the mixture. In the end and in small doses, add the shallots, little by little, so it's always possible to taste the balancing of various flavors (shallots vice versa could cover the rest). Add salt and mix well with plenty of oil. For a variation even more tasty you can add a little aged cheese.